Technically, they aren't necessary, says one dermatologist. We've all seen facial mists on store shelves. Most of them are given elaborate names like "Thermal Spring Water" or "Glow Mist." Given our obsession with skincare, the allure of facial mists is understandable. If you've never come across facial mists before, the beauty product is typically packaged in a spray bottle and promises to hydrate your skin. Most are packed with other skin-loving ingredients, too, like essential oils. However, at up to $100 a pop (we're talking about you, La Mer), are facial mists really a necessary skincare product and are they worth the money? Dr. Sandy Skotnicki, dermatologist and founder of Toronto's Bay Dermatology Centre wouldn't prioritize facial mists in anyone's skincare routine, but doesn't dismiss them entirely. "I don't really think they are a necessary part of most patients' facial regimen," she told HuffPost Canada in an email. "Water is also drying and most of them contain water, no matter how pure it is. So, unless your facial mist has some form of emollient in it, spraying with water will make your skin drier. Water decreases the skin barrier and skin lipids." However, with such varying ingredients in every brand's facial mists, it's hard to make one sweeping statement about a type of product, she posits. And while she wouldn't recommend the beauty product to her patients, she said some do contain beneficial ingredients. "I just checked out Tatcha's Dewy Skin Mist ... This isn't a water mist, it's oils and fragrance (even if it's natural) and preservatives and a whole bunch of plant extras. This mist is technologically a diluted serum," she explained. "So, I guess if you want to add a product that does not have to be rubbed in and just mists on during the day, then use these types of mists." Like every beauty product introduced to the masses, there are mixed opinions and varying experiences. Tara Pollock, 27, is a beauty enthusiast and third-year medical student in Toronto. She's someone who has found some benefits in the use of facial mists, especially in regards to makeup application. "I think for the ingredients, they are overpriced, but I do think they have benefit, especially in this era of very heavy Instagram makeup being popular," she told HuffPost Canada via Facebook messenger. "When you spray after applying a few layers of liquid and powder makeup, it makes it look much less cakey." Meanwhile, others have a more black-and-white experience with facial mists. 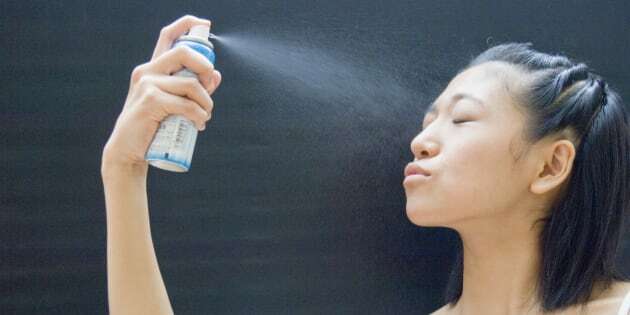 "I am of the opinion that they are nothing more than scented water in a spray bottle," 28-year-old Lindsay Mockler, who is part of the closed Facebook group Toronto Makeup Zone, told HuffPost Canada of her experience. The conclusion about this polarizing product seems to fall in a bit of a grey area, but one thing is clear: if you don't want to be duped, read the ingredients on the label. "If you look at the original concept of this product, La Roche Posay's Thermal Water, it just contains water," explained Dr. Skotnicki. Most people gravitate towards facial mists on hot days and when they're feeling dehydrated. In which case, Dr. Skotnicki recommends biodegradable cloth wipes that will also save you a few bucks over pricey facial mists. "Another thought — in the morning, you technically don't have to wash your face, so you could use a mist then and it can help set powder, makeup, etc," Skotnicki suggested. Whether you think facial mists are a big pile of hooey or a beauty must-have, sometimes it comes down to personal preference. If it seems to work for your purposes, who's to tell you to stop purchasing it?